A costume drama love story set against the backdrop of the slave trade in the 1700s. Not something you would usually find me heading off to see by myself. However as I found myself in the sleepy Highland town of Oban with work on a Wednesday evening, that was my only option. The Oban Phoenix is a fantastic community cinema, cheap tickets and a friendly feel. The screening room I saw this in has individual armchairs as seats. I managed to get the last one, and found myself, perhaps unsurprisingly, the youngest in there by a good 30 years. I didn’t know what to expect from Belle. As I said, costume dramas aren’t usually my thing but having listened to an interview with first time director Amma Asante, I was intrigued enough to give it a go. I’m glad I did. 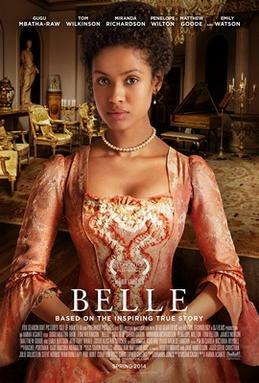 Belle tells the story of a young black woman (another newcomer, Gugu Mbatha Raw) who finds herself transplanted into aristocracy due to her father’s affair with a slave, whilst serving in the Navy. She is ‘adopted’ by Earl & Lady Mansfield (Tom Wilkinson and Emily Watson adding some gravitas) where she lives in limbo, with her skin colour preventing her from living the life usually accustomed to by ladies of the upper class. Earl Mansfield is also the Lord Chief Justice and is presiding over a significant legal case concerning an insurance claim for the human cargo drowned intentionally on a ship. The film follows Belle as she struggles to balance her high class upbringing with her morality on the slave trade, as well as a burgeoning relationship with aspiring lawyer Davinier (Sam Reid). The film is well directed, not shying away from the horrors of slavery but also managing to allow the viewer to care about the relationship between Belle and Davinier which could easily have been seen as fluff against the court case. Gugu Mbatha Raw is excellent as Belle, and certainly grows with into the role as the movie goes on and Belle becomes more independent. The supporting cast (including Tom Felton doing his best Draco Malfoy) are also perfectly good with strong roles for many characters. Overall, a pleasant surprise and, I hope, a great springboard for both director and leading lady. thanks for spending the time to discuss this matter here on your blog.